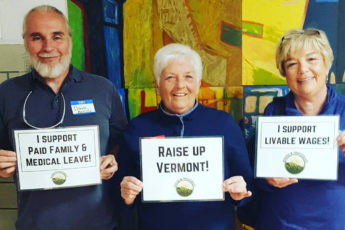 We’re asking you take a moment between now and the end of the year to celebrate with Rights & Democracy around some of the incredible victories from this past year and help us build power and organize in communities throughout Vermont and New Hampshire. We just won the New Hampshire House and Senate, and a veto-proof House and Senate in Vermont! It’s time to stop playing defense and show that our communities stand united for equity, justice, accountability, safety, freedom, and sustainability. To make this happen, we need to raise $20,000 by the beginning of January, which is when legislators convene in New Hampshire and Vermont. Give today and/or create your own fundraising page as part of our Together We Win campaign on Classy, join a team, and send out to your network! As part of this campaign, you can join a team and help raise $1,000 to support RAD’s work to pass a $15 minimum wage, enact universal health care, protect workers rights, work for environmental justice, and protect public education. Join us by signing up or simply make a donation today and send a message that when we stand together, we win!